When I was a child, the image of America as a “melting pot” appealed to me. Everyone would be welcome and blend in with the rest of society. As an adult, I saw the risk of losing some of our most beautiful stories when we assimilate into one homogeneous whole. Today I like to think of America as a “mosaic” where everyone is beautiful in her or his own way. Many readers agree. Memoirs about culture and ethnicity often make the best sellers list. Stories like Maxine Hong Kingston’s Woman Warrior, Frank McCourt’s Angela’s Ashes and Carlos Eires’ Waiting for Snow in Havana invite us into the strange (to us) worlds that shaped their identities. So how can you use your own heritage to tell your story? In my memoir workshops, I like to read a poem by New Jersey poet Maria Mazziotti Gillan called Black Dresses in which she recalls the many sensory details that describe her girlhood in an Italian neighborhood. The grape arbor, the women all in black, the soup, the front stoop, it’s all there, taking the reader back to that time and place. You can do that too. Make a list of all the images that come to mind when you think of your heritage. What were the smells in your grandmother’s kitchen? How did she dress? What holidays did you celebrate? Were there special dances, songs, costumes for big occasions? This list can be your treasure trove of writing prompts. Which items evoke the strongest emotions in you? Start there and write how you came to know about them. Where were you, at what age, and who was with you? How do you feel about them now? At a writing workshop in Saratoga Springs, NY, I discovered the poetry of Polish Nobel laureate Wislawa Szymborska. Less than thirty miles away, the women in my family had lost their voices, embarrassed by their heritage. Much of Off Kilter deals with my coming to terms with the Polish joke, the struggle for national autonomy in Eastern Europe, and the rich legacy of music and literature that might have been lost when my people came to America wanting to belong. Writing about both the positive and negative aspects helped me learn to accept them all. The next step took me to the country home of my cousin for a family reunion just outside Amsterdam, New York, the town where our ancestors settled. One person brought copies of my father’s family tree. Something quickened inside me as I stared at the name and dates of the farthest ancestor. Regina was born in 1778. What if I could meet her? What would she say? What was she like? On the long drive home to Pennsylvania, I imagined a conversation with her. What would she think of my life today? Back home, I did some research into Polish culture but found very little about her. There was plenty of history about the years when she lived, the battles, the noblemen and women, the writers and artists and composers, but precious little about the common person, especially the women. Her family was not the szlachta, or nobles. My innate sense of justice rose. I would speak for her. I would use what I knew about my heritage, and turn to my intuition and imagination for the rest. Where the Stork Flies took six years to write. I knew that I (and Regina!) had something to say, and after many revisions, wove our message into a modern fable about two very different women. One lives in the present day and has so many choices she can’t stick with any. The other lives in 19th century Poland and believes she has no choice but to follow the same path as her mother before her. Now I am excited for the next step: placing Where the Stork Flies into the rich mosaic of American literature by writers whose roots are on a distant shore. Linda C. Wisniewski shares an empty nest in Bucks County, PA, with her retired scientist husband. She has been published in the Christian Science Monitor, the Philadelphia Inquirer, the Rose and Thorn, Mindprints, gravel, Hippocampus and other literary journals both in print and online. 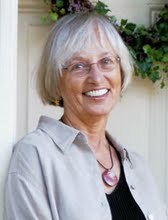 Linda teaches memoir workshops for adults in the Philadelphia area. 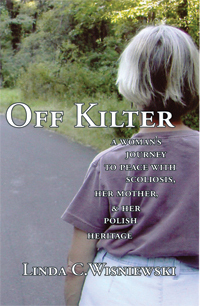 Her memoir, Off Kilter: A woman’s journey to peace with scoliosis, her mother and her Polish heritage, was published in 2008 by Pearlsong Press. She is seeking representation for Where the Stork Flies. ← Are You Afraid of Sci-Fi? Just want to say that, as one of Linda’s critique partners, it’s been my privilege to watch the birth and growth of Where the Stork Flies and believe it will be a worthy addition to the “rich mosaic of American literature”. Thanks, Sandy! Means a lot coming from you. Hi Linda, I love the idea of interweaving the stories of one you know and one you must imagine. I will be interested to hear/read how you plan to do that . . . . through transitions, separate stories, books, chapters with voice? Thanks for stopping by, Susan, and for taking time to leave a comment.